AMO+PDO= temperature variation – one graph says it all | Watts Up With That? Figure 20: using the PDO/AMO to predict temperatures works well here with some departure after around 2000. Note this data plot started in 1905 because the PDO was only available from 1900. The divergence 2000 and after was either (1) greenhouse warming finally kicking in or (2) an issue with the new USHCN version 2 data. 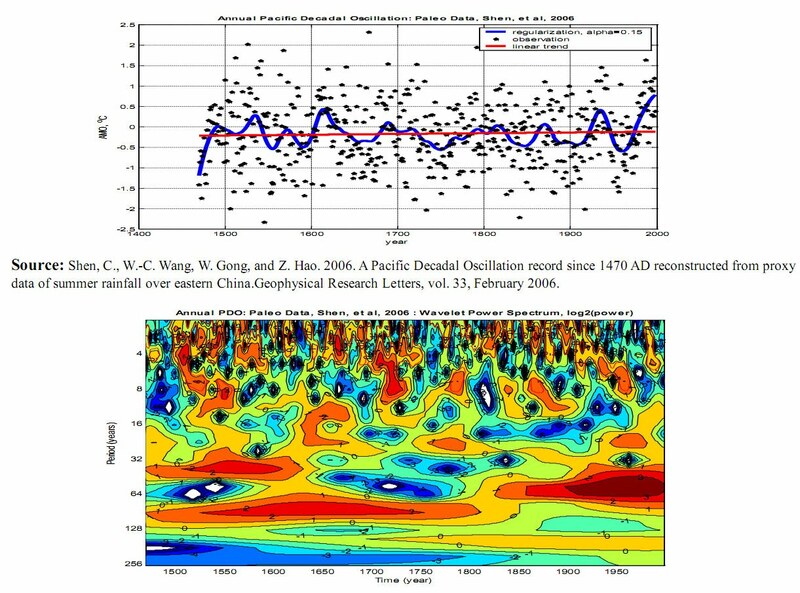 Perlwitz etal (2009) used computer model suites to contend that the 2008 North American cooling was naturally induced as a result of the continent’s sensitivity to widespread cooling of the tropical (La Nina) and northeastern Pacific sea surface temperatures. But they concluded from their models that warming is likely to resume in coming years and that climate is unlikely to embark upon a prolonged period of cooling. We here show how their models fail to recognize the multidecadal behavior of sea surface temperatures in the Pacific Basin, which determines the frequency of El Ninos and La Ninas and suggests that the cooling will likely continue for several decades. We show how this will be reinforced with multidecadal shift in the Atlantic. I want to stress that if D&E did not smooth their data, the correlation would not have been as high; but as high as it would have been, it would still have been expected. All that smoothing has done here is artificially inflated the confidence D&E have in their results. It does not change the fact that AMO + PDO is well correlated with air temperature. September 30, 2010 in AMO, Climate data, Oceans, PDO. Three possible projections are shown: (1) moderate cooling (similar to the 1945 to 1977 cooling); (2) deeper cooling (similar to the 1945 to 1977 1880 to 1915 cooling); or (3) severe cooling (similar to the 1790 to 1830 cooling). ONE Graph shows what causes temperatures to rise and it’s not CO2!!! It’s the Pacific and Atlantic Oceans! This is with a squared correlation coefficient of 0.85 which is about as good as you can get. All the climate models never get anywhere near that close. NATURE has thus once again falsified the alleged alarmist AGW hypothesis. Wow, I stand corrected… a better fit of a Squared Correlation Coefficient R2 of 0.96 when the solar activity is added in!!! Amazing! I guessed some years ago that there was a relation between AMO/PDO and the mean but never calculated it out – I would never guess the correlation is quite that high. AMO+PDO= temperature variation = Climate Science’s GCM’s have finally met their match?/sarc. AMO and PDO are both headed down; we’ve had an extended solar minimum. D’Aleo Easterbrook will be proven wrong if the 2010-2012 temperature average is not significantly below the 2000-2009 average. I really have no queston that CO2 is less of a problem than the AGW alarmists like to claim. Which is not to say it is *no* problem. If they are exaggerating by 50%, it is still worth some of our time to consider how to minimize that impact, IMO. The other question that often occurs to me, as much as I am a believer in the impact of the AMO, PDO, ENSO, etc. . . is to what degree CO2 can impact those cycles out of their historic rhthyms. I haven’t heard a satisfactory answer to those questions yet. More study? Yes, by all means. . . remake the world economy? Not yet. The fundamental difference that will be pointed out by the alarmists is that their leaders (Hansen et al) use the GISS surface station adjusted data and this paper uses the UAH satellite data. Hansen is already on record saying that the temperatures have been increasing without stop since the 70s, despite what the satellite data shows. The 2010 temperature increase from the 70s is only 0.4K or so in this paper, while Hansen has >0.8K. A difference that should invalidate one position. I admire the skeptical position that science and data trump computer modelling. A prediction is called for, an honest one, not a “projection” as weasled by the IPCC. Money and mouths and all that. Yet this paper has that “today state” problem. Not that I agree with the GISS today-state, but that is as it is. The comment that the PDO-AMO warming and cooling events are laid on top of a general warming from the Little Ice Age is a hidden gem and stone for tripping over. While true, the general warming trend from the LIA is not one that the IPCC agrees with. The IPCC model shows a halt or even cooling post 1988: the “normal” condition. Thus all warming since 1988 is CO2 related. This paper has as a base assumption that the post-LIA warming is not finished. So, two positions for the warmists to argue invalidates this paper: 1) the recent satellite temperature history is wrong, and 2) warming from the LIA stopped by 1990. I have argued that the global warming debate/war is all about the integrity of the original data and certain assumptions. The warmists accept the “peer-reviewed” data and modelling, and therefore accept the IPCC conclusions as they are internally consistent and replicable (as shown by Lucia et al). The skeptics question the data and some assumptions. We’re both think the other is tilting at a windmill, while we are the one facing a dragon. Wonderfully done, and very clear. I think you’ve ‘nailed it’. As we have several correlated slope reversals, it is very hard to dismiss this relationship as a coincidence. If this paper cannot be refuted, I think it will be a more telling blow to the IPCC consensus than the McShane and Wyner paper. Nice work. Repetition of work of late prof. Marcel Leroux. This hypothesis can be found in his books on climatology. Prof. Leroux states (based on observations) that changes in insolation and enegy flux to the Earth influence meridional exhcnge of air from polar regions. When polar region cools then the exchange intensifies; as an effect the PDO indices have larger amplitudes, and the temperaatures change as well (less solar = cooler). As quoted here researchers, one should look into Sun, clouds and large scale circulation (mostly atmospheric). Does the entire paper show global figures? If it doesn’t I’m not entirely sure how this can be understood as saying anything more than oceanic temps on either side of continental USA have an effect on mean temps, which is not entirely unexpected. Good paper. All that matters now is what the Sun does next. Currently, I see it waffling between a 1900 event and a Dalton event, meaning that if enough time goes by and it does not ramp up, it could slip behind even the Dalton Minimum. What is interesting about the Maunder is that the Decadal Oscillations were held down in the La Nina territory for the duration. It (the SC) looks like a straw that breaks the camels humps. This kind of thing always overlooks the acceleration of the CO2 effect. The CO2 increase from 1940-1970 was about 25 ppm. 2000-2030: about 90 ppm expected. I expect the CO2 increase rate will overwhelm this cyclical effect, since it has almost quadrupled since the last cooling cycle (if indeed the cooling was all oceans and no aerosols, which is also somewhat dubious), and nobody has accounted for that in these articles that talk about the 60-year cycle. That would be lovely to know that. I’ve been trying to find what causes the El Niño, and haven’t found anything on it. Everyone seems to assume the El Niño is the cause of other things – as if it just appears out of nowhere. I have some ideas, but those and $3.00 will buy me a cup of coffee. 2. we already know the SST is fairly well correlated with the temps you see over land. “Somebody at Steve McIntyre’s Climate Audit kindly linked to an old article of mine entitled “Do not smooth series, you hockey puck!”, a warning that Don Rickles might give. Smoothing creates artificially high correlations between any two smoothed series. Take two randomly generated sets of numbers, pretend they are time series, and then calculate the correlation between the two. Should be close to 0 because, obviously, there is no relation between the two sets. After all, we made them up. One graph did say it all. You do not prove anything by taking one times series that is built from SST temperatures and a second times series of temperatures, smooth them and then regress. Except that a smoothed times series of temperatures correlates with another smoothed series of temperatures. Oh dear: […] the more smoothing, the higher the correlation. Oh dear, indeed! Don’t compute r-squared on smoothed data. Especially not if the smoothing is over many points [22 in this case]. Meanwhile, there is related good news — the salmon are returning to the Fraser and Adams Rivers B.C. “The Fraser River salmon runs are much smaller than those of the Adams River, which pass in October. This year’s Adams River run is currently forecast at a hefty 8 million salmon. The PDF contains much of the straight data, so I wouldn’t discount it just because of the smoothing comparison. The favoring of El Nino/La Nina during the various stages of Solar Cycles is more interesting. The one thing I would not be certain of is whether the PDO & MEI turned into thier cold phases in 1997. Looks more like 2007 to me. 1997 is where it starts tailing off. Great. The relationship couldn’t be clearer! Everyone who is exposed to that awful 10:10 video should be given this to read as an antidote. However, surely if the relationship is there in the series the analyses really need to be done with yearly data? A high correlation coefficient between two sets of highly averaged data is meaningless in this case. Not without reading e.g. Lucia’s blog first to learn how to appropriately treat the correlation you’ve introduced to your series by smoothing. It can be treated correctly, if you’re careful though. From what I can see, between 1905 and 1975, temp seems to be preceding the AMO+PDO. It could be a slight aberration in the data, the smoothing, both or adding AMO+PDO together. Better check it, or we’ll have The Goreacle saying that it’s complicated, but whenever the temperature goes up, the oscillations go up.. The points being made on this thread about smoothing are valid for the comparison of two series for which a one to one relationship is sought. However climate is complex, as we know, and many factors act to make the short term data very noisy. Without sufficiently good models to enable the removal of short term influences, smoothing is the one way to try to get a handle on possible principle underlying causative factors. is clearly the wrong way to use the data, but this does not mean we should toss out any and all smoothed series comparisons. They have a use and value, just not a useful numerical ‘truth’ value. I was under the impression that 1934 was the hottest year in the US record. 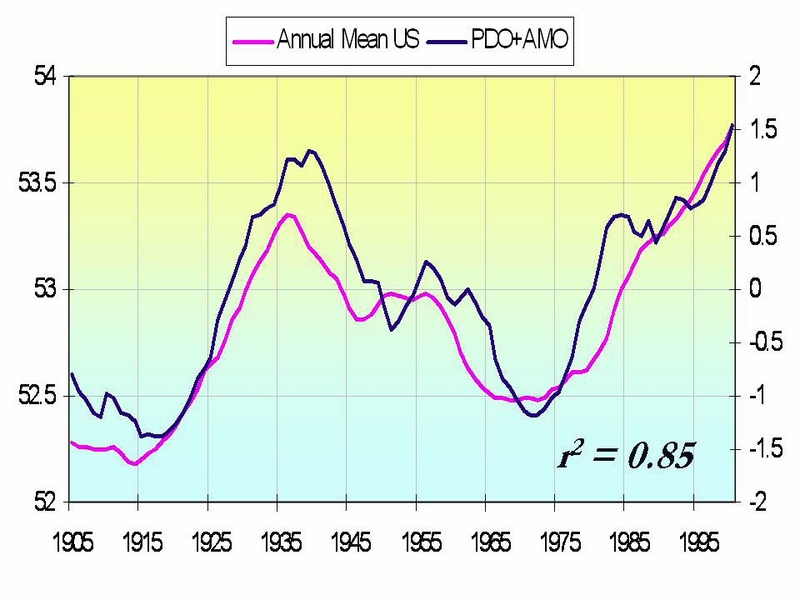 Appart from the big smoothing before correlation problems already mentioned, in the graph presented above I see temperatures leading AMO/PDO until 1975. Causality, if it exists, doesn’t seem to go in the direction that the author pretends that it goes. this does not mean we should toss out any and all smoothed series comparisons. They have a use and value, just not a useful numerical ‘truth’ value. Of course they have value, just don’t calculate r-squared from them. If you want to suppress noise, then use averages. E.g. with a 100 data points, calculate the 5 average values of successive blocks of 20 points. Do this for both time series, then calculate the regression and the statistical significance of a line through those 5 data point pairs. Guys, don’t forget that correlation does not equal causation especially with smoothed data. Having said that, it is quite logical that there will be a connection between temps and AMO + PDO. After all, the oceans drive the weather/claimate. As regards a couple of points raised by Doug Proctor (post at 9:06 hrs on 30th Sept), how the heck can we know that the natural warming from the LIA ceased at 1988? I would like to see the IPCC’s proof of that including a detailed account of the drivers that caused the warming from the LIA and how these diminished over time such that by 1988 – they no longer produced any forcing of temperature. Second, as regards the contention that as from 1988 the warming is all AGW all I can say is that if that is so, it didn’t last very long given that Phil Jones has acknowledged that there has been no warming of statistical effect for the past 15 years, ie., since 1995. That therefore leaves just 7 years of AGW. Surely the procedure for correlating smoothed data sets is well known (Papoulis, Bendat & Peirsol). The number of degrees of freedom of the data are reduced according to the serial correlation in the signals. However, I agree with the general point that smoothing data for its own sake is dangerous. It is well known to introduce spurious trends. If one has data that may contain errors, and one smooths the data, there is an assumption about the spectral characteristics of the errors that may be completely wrong. I agree with Bob Tisdale. Mixing apples and pears. PDO is independent of what is going on in the Atlantic. As noted earlier, the D’Aleo and Easterbrook combined AMO+PDO graph is erroneous because they’re adding datasets that are created differently. They should have used either detrending of SST anomalies like the AMO or PC analysis of detrended SST anomalies like the PDO. …wouldn’t work because the USHCN data has a trend. I did a similar thing a few weeks back on my website, except I used the AMO only and also used the CRU (Yes, CRU global data) and the correlation was also very good for the entire global mean. The most recent article is also lots of fun. It shows how poorly the original idea behind global warming from Arrhenius fits the actual temperatures over the past 80 years. Too bad we can’t get a meteorologist, a geologist, a solar physicist, a polymath, a statistician, and an oceanographer to sit down with a jug of Cuervo and knock out a climate paper that we could all enjoy. WUWT has featured posts on adjustments to official records that have reduced temperatures during the 1930s peak relative to recent temperatures. It would be interesting to see the first graph of this post, with “unadjusted” values. Even if they are exact, and I think they are, those calculations are too complex for the simple minds that constitute the majority of the population (and our governments). They prefer CO2 explanation. Smoothing is no longer the data. You have broken the eggs to make an omellete. To create a snapshot. Smoothing is algorithmic, not statement, smoothing is approximation. Smoothing is not statement and algorthimic process is not statement. It is approximation and can only be used as long as the fit to curve works. Algorithm relies on data not the other way round. 1940-1970 and 2000-2030. Has we lost 30 years? The best interopolative algorithims refine on modern data, better data measurement the data itself. But not smoothing, weighting measured to recent data and collection method. Yer I know back in yer box Jack. Me I got chucked out of Maths in project work, not the maths the interpolation side. I was working for a dickhead. I took a pass conceded lost 3 honors for 3 passes and traded for the degree. I hold a degree in modeling mostly. Data is paramount in modelling. Data measurement will always improve. Has to, as science and tech improves. Slipstick to computer is analogous to most science. This is Anthony’s summary of work by Joe D’Aleo. It predates my “obsessive” involvement on WUWT by a few weeks, that happened in large part to hearing about this from Joe directly. This convinced me that CO2 wasn’t dominant and with the negative PDO in place things were about to turn interesting. It’s nice to see an update, it’s even nice to some criticism about the techniques. That can only serve to improve the study (note – improvements may falsify the study, pesky thing about improvements). Now I have to sit down and apply all of this to Bob Tisdales comments and papers. Curses. Let me add my own criticism. Figure 3 shows the PDO and a polynomial fit to the data. Polynomial fits are fine for some applications but are utterly worthless as projections on either end – if Joe plotted the polynomial for five years on either side of the fitted data it would be obvious. The fit within a few years of either end is nearly as misleading. Look at the left side. While the unfitted data is oscillating around about 0.2 (doesn’t seem to warrant the label “cool”), only a polynomial fit could be that bad, going from +0.8 to -0.2 to 0.0. Anyone who looks at that figure and wants to see where we’re heading is welcome to do so – just don’t follow the polynomial! So, there’s still lots to learn. My conclusion that “things were about to turn interesting” has held up. The effect of CO2 is logarithmic not linear. So in theory twice as much CO2 is required to be added to the atmosphere to provide the same radiative forcing effect of the CO2 already present. There are some claims made that CO2’s forcing is already effectively saturated. But if the temperature continues stable, or starts to rise at all over the next few years (if the data can be trusted) then the sceptical position is not strengthened by this, but weakened (though not demolished since there are other imponderables!) Be careful what you wish for . . . . . Unfortunately, the PDO and AMO are not similar datasets and cannot be added or averaged. The AMO is created by detrending North Atlantic SST anomalies, while the PDO is the product of a principal component analysis North Pacific SST anomalies, north of 20N. Basically, the PDO represents the pattern of the North Pacific SST anomalies that are similar to those created by El Niño and La Niña events. In response to this and others, the weighted influence of the oscillations on the regional climate data can certainly be applied either sequentially or as an average as long as the weighting is consistent with the degree of influence. Terrible science. You should never smooth before calculating R2 or any other key metric. The chances of creating a spurious correlation between unrelated data sets is dramatically increased if you do. Did Mann produce that graph? Very interesting, not so much the paper as such but in the “sceptics” publicly discussing and showing possible errors in a paper which apparently proves their case. This appears to be a more valid scientific discussion than that shown by the calamatists. Perhaps the amateurs have something to show the professionals, much like the amateur physicist A. Einstein (a clerk who only held a teaching diploma in mathematics). He should not have had anything of interest to say but only changed the basis of physics. One wonders how he would have been received if he had needed to be “peer reviewed” before publication. I am not a fan of smoothing so I don’t use it unless the underlying data series is just too noisy to be useful (and then I only smooth it the least amount possible). US temperatures, however, are very noisy. It is so noisy that one can’t do anything with it. Here is the US monthly temperature anomaly (in degrees F). Putting in place a 12 month moving average now results in something useful and probably provides a pretty good representation of the US Climate (now in degrees C). Note the US has not warmed much over the last 100 years and there has been a substantial downturn in the last 4 years. – and the PDO is not really significant in influencing US temperatures. Basically, I think we need a new measure for what the PDO is supposed to reflect – the influence of the north Pacific on climate. Maybe a longer smoothed series is better but the current PDO index doesn’t actually match up with any temperature series. …is the Hoyt and Schatten data, and it’s obsolete. If memory serves me well, Hoyt and Schatten created that dataset to explain the rise in global temperature from 1900 to 1940, so they should correlate. Because as scientists we all know that if our predicted results don’t match up with the observed data, there must be something wrong with the observed data. This isn’t my area of expertise, but is that seriously what they’re saying? Maybe a longer smoothed series is better but the current PDO index doesn’t actually match up with any temperature series. There’s more than one influence, Bill! OK. Let us suppose that what is called the PDO is, as has been suggested by many and is supported by careful analysis, a long-term integration of ENSO tropical anomalies. All well and good. It still remains the case, though, that we have a sixty-year cycle of dominant El Niño / sardine events alternating with dominant La Niña / anchovy events, which is reflected in differing SST patterns in the North Pacific, and which remains unexplained. This is the point that was being made, I believe, by a number of commenters on various PDO articles. Thus the PDO still remains to be explained, whether it is “independent” of ENSO or not. I COMPLETELY agree about not smoothing the data. It is the real data that enlightens us about climate, not the smoothed data. At the most, I would agree that a three month running average, for each geographic biome, can and should be compared to three month running averages of strategic geographic SST’s (ENSO style). Atmospheric pressure systems and major trade winds should also be so compared. I repeat, no more than a 3-month running average should adopted as the standard for all atmospheric/oceanic known systems. The Australian BOM update showing the current La Nina is growing stronger. A La Niña remains well-established in the Pacific. Given the current strength of the event and the outlook from long-range models surveyed by the Bureau, this La Niña is expected to persist into at least early 2011. All indicators remain firmly at La Niña levels. The central Pacific Ocean is cooler than the long-term mean both at and below the surface, the Southern Oscillation Index (SOI) remains strongly positive, trade winds are stronger than normal and cloudiness over the central tropical Pacific continues to be suppressed. Such consistent signals indicate the tropical atmosphere and ocean are now clearly reinforcing each other. The SOI graph is looking very strong. This will be bigger than 2008. …is the Hoyt and Schatten data, and it’s obsolete. Plus he calculated an R^2 on heavily smoothed data, so the whole analysis is worthless. There are no current solar threads active….so I will ask the question here. Did anyone notice the huge jump in F10.7 flux when negative sunspot 1108 left the face 2 days ago? Thanks for the reminder. Ought to be worn as a phylactery by those flogging stats. Huge and huge? Small jump. Huge F10.7 is 300. Sunspot 1108 was not ‘negative’ or abnormal. A ring of opposite polarity often forms about lone spots. The increase in F10.7 is not related to the disappearance of something that would raise F10.7. The Sun is messy. Don’t over-interpret the data. Maybe with all your wisdom you can tell us why the F10.7 record jumped from roughly 80 to 90 while in the background the the sunspot area is diminishing with no flare activity? This is definitely more in the climate category than the weather category. The point of which is there is a natural signal and an anthro signal in the global data. Neither signal is known to be anything but cyclical, and the science is far from settled regarding positive or negative feedback. We know from the historic record that climate swings from one condition to another, and that no condition has been permanent, and that no swing was ever unidirectional. Regarding the feedback loop, we don’t now the system gain, the period (20 years, 100,000 years? ), if it is critically damped, or undamped (of so expect wide variations). And we don’t know if there are tripping points in the loop – reachable limits that will destabilize the loop forever without other influences. Most people have never had the opportunity to watch an Anschüetz gyrocompass start up cold. This is a heavy sphere about the size of a bowling ball and which has two internal gyros fitted. It floats top side up in a temperature controlled electrically conductive fluid inside a spherical chamber. There is no mechanical connection between the sphere and the container it rides in. It was designed by Hermann Anschütz whose cousin was Maximillian Schuler. Schuler’s name is affixed to the curve generated by the gyrocompass as it stabilizes on startup. See more at Schuler tuning for his work in pendulums and gyros. Until Schuler discovered the natural periodicity of the system, practical gyrocompasses were impossible. I think there are natural periodicities to be discovered. And when you watch one spin up, you’d swear the wide swings will never stop. They do – Schuler guarantees it. the whole analysis is worthless. Well then, Ladies and Gentlemen, I guess that settles it, doesn’t it. y = a + .2bx(t) + .2bx(t-1) + .2bx(t-2) + .2bx(t-3) + .2bx(t-4). The fit is better because you are regressing on current PDO and past PDOs, but not in a correct way. y = a + bx + cx(t-1) + dx(t-2) etc. Then the regression would separately estimate the effect of each past year’s PDO value on temp. The fit of the regression would be better because you are allowing the regression to choose the coefficients b,c ,d etc. instead of forcing them. It would also tell you which years have the largest effect on temp. @ Pamela Gray, Mattstat and others. I agree that computing r2 comparing smoothed signals without allowing for the reduction in degrees of freedom imposed by additional serial correlation is plain wrong. However, if the hyopthesis is that the temperature is related to the AMO and PDO as a liner system, simple correlation is not the best way to look at the problem because it obscures the temporal relationship between the two signals, i:e does temperature follow the oscillations or lead it? This is, from a point of view of mechanisms, rather important and the lead/lag relationship in the graph shown is rather difficult to interpret because the PDO+AMO leads temperature when temperature is increasing, but lags it when temperature is decreasing. I would guess that this is because the averaging (smoothing) process is a filter which has eliminated the high frequency components in both signals that determine their relative phases – a well known problem. I would therefore go along with the commentators who have said that one should work with the raw signal and performed a more formal correlation that involves a consideration of phase shifts and extracted the degrees of freed om of the signals from their serial correlations. That ‘trick’ has been used before. 3.) Make sure the proof window is short, to accomodate the natural fluctuations of climate about the mean. 5.) As soon as the fluctuation hits the target, run away to the next agenda item but continue to cite the ‘frozen in time’ proof. 6. Never update a “proof point” that has turned sour. Leif: Geoff is talking about a certain ‘type’ of sunspot where, when it round the limb to the backside, the flux rises abruptly. The converse is true when this type of spot first appears. It’s a current behavior of the Sun that we have been watching. Well since I’m not a climatologist, so I don’t exactly understand who or what AMO and PDO are; but I accept that those in the trade probably do; so I am just looking at graphs of data. Well actually I guess I’m really looking at graphs of what is left over when the original data was thrown away with “smoothing”. I’m not a fan of throwing away real data that was presumably obtaiend with difficulty and at great expense; and then replacing it with faux data. If you complete the smo0othing process, you end up with just a single number for the whole data set (each one you are trying to compare. So you will eaither get the same number from each set; or you will get a difefrent number so you can comment on that difference (or sameness. But I get the gist of what they are trying to do. For those who say the fit is “almost too good”; well I’m seeing enough differences that I wouldn’t describe the fit as too good. But certainly enough sameness to make one wonder if they are somehow related. The second curve; the AMO/PDO regression fit does not to me look like the best fit of these two curves. My eye says that these two curves were force fit to a perfect match at the start; and then diverge (increasingly) thereafter. If I assume that these two cuves are extracti0ons from an even longer data set; that the authors do not have; but fear not Mother gaia has all that data; then I would not just accept that they should exactly match at the starting point where the authors come into the picture and start logging data. so my suggestion is; Can you get an even better match of the same raw data; if you let the two data sets “float” so that you don’t force a good fit at the start at the expense of a bigger divergence at the end of the frame. I notice that the Temp is just for the USA; which conveniently sits almost exactly positioned between the Atlantic and teh Pacific; how likely is that ? Well I’m just shaking your cage here. You’re suggesting that the combination of whatever PDO does and AMO does, is pretty much sufficient to describe to some fairly respectable degree what will happen over the USA. Izzat the first time any such relationship has been hinted at ? Rather interesting; but I still don’t like throwing away data and trying to convince one’s self that you are gaining information rather than losing information. Reminds me of the chap that predicted the value of the fine structure constant to better than parts in 10^8; by completely throwing away all information about the entire physical universe; and making the number up out of whole cloth, mathematically. Watch out; it could happen to you. Ok so I can see where smoothing (removal of high frequency components) would make two time series generated with white noise more correlated after smoothing than before but less clear about red or brown noise generated series. Maybe with all your wisdom you can tell us why the F10.7 record jumped from roughly 80 to 90 while in the background the sunspot area is diminishing with no flare activity? F10.7 does not directly answer to sunspot number or area, but rather to the integrated effect of emissions from loops in the corona. If you have several [even small] active regions close together [like 1109 and 1110], an extensive loop system develops with increased F10.7 as result. Indeed is you base it on high R^2 on heavily smoothed obsolete data. Leif: Geoff is talking about a certain ‘type’ of sunspot where, when it round the limb to the backside, the flux rises abruptly. No such thing. The Sun is just messy. You can find all kinds of odd behavior, if you want to. I’ll suggest that if SPPI wants to have any credibility that they send out pieces for HARD critical review. The harshest critics they can find. I can think of three from these parts.. one who covers the sea, one who covers the sun, and a third who covers the land. screw peer review. you want to “murder board” this stuff. Adding in ENSO will probably improve the fit. The divergence starting in 2000 looks like it’s actually starting closer to 1998 when a record setting El Nino took place. 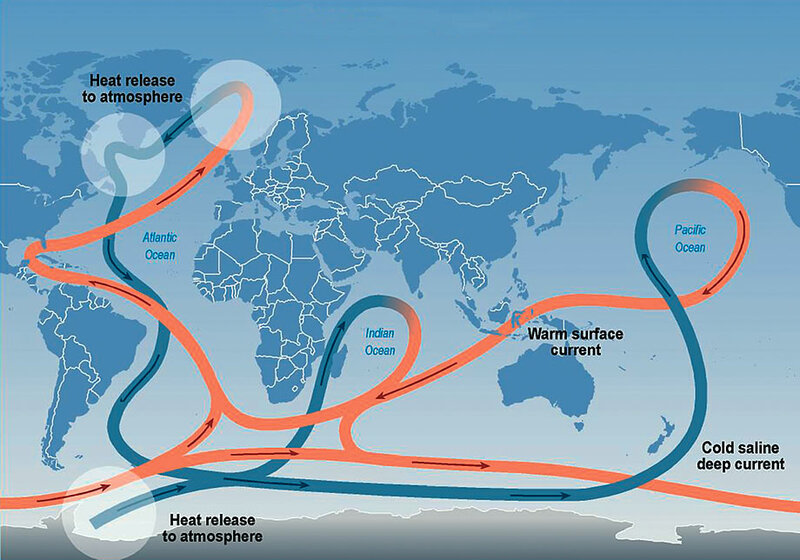 In any case the global ocean drives the climate. Its average temperature is 4C, it has 1000 times more mass than the atmosphere, and it’s dynamic. We need to figure out what (other than the sun) drives the ocean. In particular the mixing of the frigid deep with the warm surface layer – how much mixing occurs, when, where, and what factors can vary it. I agree. What could be good work is getting subverted, in my opinion, by emotion. At this point I would like to see ASA or one of their journals conduct a review of the statistical methods used in the prominent climatology papers. A scorecard (over confident, confident, flawed, etc.) with recommendations for improvement would really help clear up the battlefield. Weakened trade winds result in less mixing of warm surface layer and cold deep water allowing the sun to warm the surface layer more than when trade winds are stronger. If you take the Total Solar Irradiance for the last 110 years, you get a real eye-opening overlap with AMO/PDO and Temperature. Meanwhile, poor little CO2 and fossil fuel use plots just go willy-nilly, having no relation to temperature, whatsoever. Climate Change (nee Global Warming) marches to the tune of planetary mechanics. CO2 is just coming along for the ride. ‘I’ll suggest that if SPPI wants to have any credibility that they send out pieces for HARD critical review. The harshest critics they can find. I can think of three from these parts.. one who covers the sea, one who covers the sun, and a third who covers the land. Agreed. Good work will hold up. And Bob Tisdale seems to have to make the same points re PDO and AMO over and over again on various threads. It must be like trying to herd the sea while ploughing cats. Through my last several years of reading climate blogs I have learned some great defenses here that Joe D’Aleo and Don Easterbrook can put to work. 1. The method used may be wrong, but the results are consistent with numerous other peer reviewed climate research studies. 2. Regarding the regression fit and that nasty divergence after 2000, there is a climate science approved trick that can fix that right up. Perhaps trick is a poor choice of words, it’s more of a “good way to deal with a problem”. 2) the premise that a post-LIA warming event is still going on, rather than it stopped in the late 80s, as the IPCC report. What effect do these two points have on the conclusions? The warmists, I suggest, would make the paper invalid because of them. The statistical details fail if the underlying data/assumptions are wrong – exactly what us skeptics claim is wrong with the whole CAGW by CO2 hypothesis. No comments? Am I wrong in these points? Correct. The closest we can get to a simple solution of the interlinked/dependant cycles seen in our climate is to examine the behaviour of driven pendulum/oscillators. The signal from any possible effect of human activity cannot be separated from these natural cycles as it will be smeared across many processes and trying to identify and separate all these tiny ‘human’ dTs is outside the granularity of our measurement systems. Are not the PDO and AMO defined with “de-trended” data i.e. with the warming trends removed. If so how can they be used to prove that there is no overall warming? Also surely these oscillations are spacial as well as temporal i.e when one part of the Pacific gets warmer, a different part gets cooler with the net effect averaging to zero as required by basic thermodynamics. If so how can this be used to say anything about the presence or absence of a global effect? How very true! But, referencing widely-acclaimed monographs will not deter some web-resident “experts,” who don’t understand the basics of signal analysis, from drawing quite a different conclusion. After all, were talking “climate science” here. As for the results, there is little new or suprising here. As others have pointed out, low-frequency temperature variations at continental stations should resemble those of surrounding oceans. Let me try to explain why each and every study that tries to “explain” or “model” the temperature by appealing to factors such as SST indicies or sun spots or almost anything else ( position of planets, etc ) is destined to be taken to pieces and shown to be wrong in some fundamental way. The whole enterprise is mistaken and wrong from the start. Let’s just start with the fundamental physics which all these approaches ignore. GHGs will cause warming. Aerosols will cause cooling. If you leave those two out of your equations, you are going to be wrong. One way or another, you are going to be wrong. Next, the real criticism of AGW lies not in criticizing the properties of GHGs, But rather in understanding how the models are uncertain. That is, the climate is very complex. understanding how much warming we will see is very complex. e have reason to doubt the accuracy of large complex models…. WHY, why why, would you even think that a simple model using SST indicies could explain everything you needed to know about the future climate. So, if you believe that climate models are barely able to predict the future, if you beleive THAT, then you can with impunity reject any simplified “regression” . It has to be wrong. The joy is in finding which way it is wrong, but you know its wrong. So everytime I see one of these things I know its wrong. I know the various classes of mistakes that are made in these types of approaches. I know the various methodological tricks one can use to make results look good and deconstructing them is shooting fish in a barrel. I know that any approach that starts by fitting observational data to a set of equations is wrong wrong wrong, if it leaves key variables out. Harvest time in the vineyard is based on (among other things) the accumulation of heat by wine grapes over the summer. Harvest time and grape quality are great ways of summarizing, or integrating, weather with respect to long term expectations – especially that of the vines. That said, in central Washington State’s vineyards the summer was underwhelming. I’d rather work with grapes and wine than all those messy numbers, smoothing, and correlation (or lack thereof). Nonsense. In advanced physical geography there is a novel concept called scale. Aggregation criteria affect spatiotemporal pattern. The responsible thing to do in exploratory data analysis is report on such variation. Statistical inference is quite another thing – and the assumptions upon which it is based rarely hold in nature. One very clear example is the ENSO. A natural oscillation that effects global temperatures by a clear +/-0.2C and is not caused by GHGs or Aerosols nor any climate forcing included in any climate model. The ENSO regions as well, have not warmed at all in the last 140 years – flat that is. So, your statement is prima facie incorrect. Now take the simple idea about how the ENSO works and one can indeed extend that to other ocean areas and prima facie, we can start to include other natural oscillations that have a temperature impact that are not caused by a climate model forcing. Smoothing seems to be widely misunderstood here. The effects of any data smoothing on the signal can always be determined EXACTLY from the z-transform of the smoothing weights, yielding the both the amplitude and phase characteristics. As Bill Illis demonstrated with US monthly anomalies, we gain insight by eliminating intra-annual variations. The advisability of smoothing depends entirely on the signal characteristics. What it does NOT do however, is introduce spurious correlation between two time series, where none existed before. Computer results suggesting it does are the artifact of algorithms that fail to produce truly independent sequences of random numbers. Nor is it true that smoothing always increases correlation. If the coherence is largely at high-frequency compnents, smoothing them away will DECREASE THE CORRELATION. “Take two randomly generated sets of numbers, pretend they are time series, and then calculate the correlation between the two. Should be close to 0 because, obviously, there is no relation between the two sets. After all, we made them up. Incorrect. Your awareness-raising exercise was worthwhile, but you’ve gone wrong with “always”. Exceptions exist. What is the relevance of this. The UAH record began in 1979. I can’t see what your point is. I did read the earlier post. Can you define what you mean by a “post-LIA warming event”. When did it start? What triggered it? It’s impossibe to comment on such vague concepts. and 90 ppm should be divided by 370 to compare them (.08 versus .24), so OK the warming effect sixty years later is three times as much, not four. As I said, it is accelerating. Sorry. 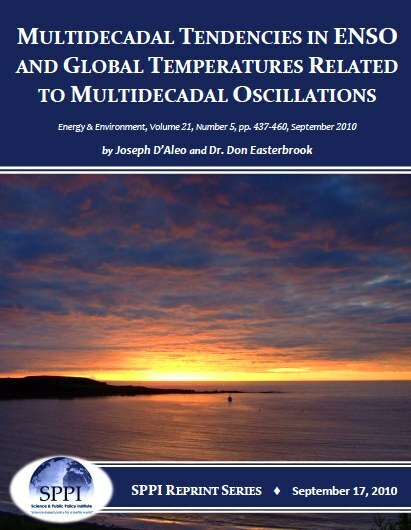 I meant to say, that I think Joseph and Donald have demonstrated that the natural climate variations are embedded in the natural decade oscillations, which were demonstrated to correlate and it would be surprising if they were not although the relation would not be immediately evident. I understand Leif has concerns about the data, as outdated, but unless there was a determinate error that I’m not aware of in the old data, random and indeterminate errors of the would still be expected to correlate – there being as much variation above and below the means. Thanks for gracing the forum with these eloquent words. Can you produce the hypotheses that imply your prediction? I think, my friend, that all you are doing is reading a graph and guessing about its extension into the future. Without hypotheses, that is not science; rather, it is a hunch. I do not mean to pick on you. But I believe that far too much of what passes for climate science is not science. The reason is that climate scientists offer no hypotheses that can be used for prediction and explanation of future events. Instead, they look at graphs and offer their hunches about the future. That is not science. What reasons are given for the claim that warming from the LIA stopped by 1990? What reasons could possibly be given? Maybe the LIA warming paused and restarted. It is nature, you know. That is because what you are seeking does not exist. Climate science is in its infancy. There is no set of hypotheses which explain the phenomenon known as El Nino. If the Warmista, who call themselves scientists, would just acknowledge this fact then there would be no AGW/AGCD scare. The science is in its infancy. Yes, and those might be the first physical hypotheses in climate science. Until that time, everyone should adopt the humility appropriate to science and stop claiming that the world is about to boil. Bob Tisdale says: Also, the “60 year cyclical nature of this cycle” [PDO] does not exist prior to the instrument temperature record. That is, there are no 60-year cycles in any of the paleoclimatological reconstructions of the PDO. 1) See Bill Illis’ example of a sensible application of smoothing. Misguided “all smoothing is bad” chants. “PDO” has taken on a (very widespread) colloquial meaning that does not match its scientific meaning. While it may be obvious that smoothing over the day & the year (nice, well-known, stationary cycles) has merit for some purposes, it may take a bit more contemplation to appreciate the plethora of less clear-cut examples that attract intense focus in fields such as advanced physical geography. Ever heard of “Simpson’s Paradox”? Wavelet methods (just one example) apply a smoothing operator by definition. Aggregation criteria affect spatiotemporal pattern. Nonstationarity is a feature of nature. Randomness is often a silly (but mathematically convenient) assumption. Tradition is no excuse. Mike M.: Not a bad idea to encourage such mixing. Your challenge of Bob Tisdale’s claim is unsuccessful. However, whether these reconstructions represent PDO, something related to it (in a perhaps complex manner) – or whatever – could be debated endlessly. Natural oscillations need be neither stationary cycles nor 60 years long to be natural oscillations. It’s fair (at this point in time) to say there have been a pair of near-60-year oscillations in the recent past. I have not yet seen a convincing argument that the recent pattern can be extrapolated (to forecast the future by simply using a 60 year wave). Like this site for example? The ‘old data’ in question was the TSI reconstruction by Hoyt and Schatten. Thus not measured data, but an attempt to guess what the TSI was in the past. The ‘outdated’ bit is that we now know that the method to do this is in error and that therefore the inferred TSI is wrong [or as you might put it, has ‘a determinate error’]. 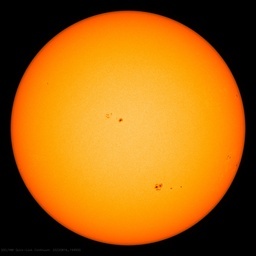 Perhaps it wasn’t so noticeable when there were plenty of large sunspots (the messy sun), but now that there are only a few at a time, the show is on. A low activity Sun is an uncluttered Sun. Joe and Don have been a bit ‘ lazy’ in going for the easy assumption that the two biggest ocean cycles must be directly correlated and that in themselves they are powerful enough to override everything else and then drive climate changes. I realised the weakness of that a long time ago and so have presented a rather more complex scenario. Firstly, the Pacific and Atlantic Oscillations are not well correlated to each other. Secondly there are other ocean cycles that have a bearing on the global net SST contribution to the energy budget at any given time. They can vary the net Pacific/Atlantic effect over time and sometines supplement and sometimes offset the Pacific/Atlantic effect. Thirdly the oceanic effect on the flow of energy through the atmosphere operates through an intermediary namely the size, intensity and latitudinal positioning of the air circulation systems and as we are seeing from the apparent effect of the quieter sun on the polar oscillations that is also affected by solar variability. As regards other variables although there are many they tend to balance each other out over time leaving solar and oceanic effect predominant so I tend to ignore other variables on longer time scales. The effect of changes in GHGs would be a relevant variable save that in my judgement the effects are too small to be measurable within the large range of natural variability caused by solar and oceanic effects combined with the levels of natural chaotic variability within the system. Furthermore Miskolczi’s point about the relatively stable optical depth seems to show that the effect of GHGs is naturally regulated by the speed of the hydrological cycle which works to maintain a steady optical depth by varying total global humidity. So, Joe and Don are approximately at the same stage I was some ten years ago when I first became aware of the emerging significance of ocean cycles but not happy that they were enough of the whole story to rely on them exclusively. It was the start of the equatorward shift in the jets from around 2000 that started me off and it has been quite a trek. (i) the mechanisms that must exist within the oceans (all of them combined not just Pacific and Atlantic) that appear to impose (subject to that solar influence) the 500 to 1000 year variability revealed by the Roman Warm Period, Dark Ages, Mediaeval Warm Period, Little Ice Age and Current Warm Period. I take Bob Tisdale’s point about the PDO, Pacific SSTs and Pacific Decadal Variability being different from each other but the distinctions are hopelessly confused in the general discussions of the subject even amongst experts and I find it very difficult getting points across to people unfamiliar with those distinctions without using those terms in a manner that Bob disapproves of. I think Bob is right about everything ENSO related and I would like to see him extend his analyses beyond ENSO to the longer term Pacific Decadal Oscillations but I understand he is not interested in doing that which is a frustration to me because that extension would supplement my musings very well. I’ll just have to manage without him. That sort of differential warming and cooling in the different layers of the atmosphere could well reverse the solar effect on specific layers and in particular the stratosphere the temperature of which sets the strength of the temperature inversion at the tropopause and that is intimately related to tropospheric pressure distribution hence the apparent effect on the polar oscillations. Reversing the sign of the solar effect on the stratosphere is critical to my current hypothesis on the basis that the jets cannot move poleward unless the stratosphere cools and will only go equatorward again if the stratosphere warms. Yet the jets move poleward when the sun is more active and equatorward when the sun is less active. That is the opposite of what ‘should’ happen yet we see it. I need Leif’s explanation as to why a more active sun could result in a cooling stratosphere and a poleward shift in the jets or a less active sun a warming stratosphere with an equatorward shift in the jets. The positions of the air circulation systems are responses to the temperatures of the oceans. Yes Bob, I know but your comment is too cryptic. Do you mean the oceans alone ? If so then I would have to disagree because the sun also seems to have an effect from the top down. Furthermore the polar oscillations were clearly highly positive when the sun was active and are now much more negative with the sun less active. The solution has to be that the air circulation positioning modulates the energy balance between bottom up oceanic forcing and top down solar forcing. In doing so it responds to both simultaneously and proportionately to the scale of the respective forcing effects from moment to moment. If I can get you and Leif on board with that (or at least accepting it as a possibility) then as someone else said, I’m home and dry. If I can’t get one or both of you on board then I can only convince by showing up the illogicality of your respective positions. Having read the original article published by SPPI, it appears to me that the statistical, and more importantly, the signal processing methods are seriously deficient and contain a number of very elementary errors. My old Prof when I did my PhD used to remark that signal processing is a “field covered with traps for young players” and that without careful and rigorous analysis, one could blunder into major errors without recognising them. If the SPPI publishes work such as this, they are leaving themselves open to substantial attack by agnostics or warmists who have a proper background in signal processing. I can only suggest that the SPPI institutes peer review of their papers to ensure that the methods do not contain glaring errors and so avoid the risk of a kick in the b**ls. Yes, but doesn’t Liu & Weng 2009 attribute the stratospheric warming post 1996 to an increase in stratospheric ozone? Interesting ideas – not trying to be picky for the fun of it btw. I share your interest in the behaviour of the jet streams. Must be going soft in my old age. You go on to remind us that GHGs and aerosols are not figments of the imagination but caution against uncertainty in the GCMs re projections of warming. Like Bob Tisdale on the PDO, you must run the risk of RSI by repeating yourself endlessly on this point. It’s a civic duty, I’m afraid. Regarding the current debate over drivers of temperature variations. Ship’s logs have great historical information on trade winds. Strong Easterlies, and the diminution of Easterlies, have been documented. Thus we can reconstruct the onsets and offsets of El Nino/La Ninas previous to the modern record. With this in mind, correlations can be made of temperature changes through careful use of a variety of proxies, ship’s records, and other recorded histories of temperature variations. My opinion, and the hypothesis that is still at the top, is that ENSO parameters strongly and directly affect land temperatures and weather pattern variations, leading to great differences and wide variations in atmospheric weather pattern changes, along with land temperature variations. These variations are much, much wider than anything the Sun is capable of driving in terms of variation, along with anything greenhouse gasses and ozone changes are capable of driving in terms of variations. Flat out, the capacity of the oceans as the driver of variations, driven by changes in equatorial trade wind systems (which itself starts with the Coriolis affect) to affect all other parameters, is simply overwhelmingly stronger. Yes indeed they do but I don’t think they are right. The point is that the jets started to shift back equatorward at the same time as the stratosphere started to warm so on their reasoning it must have been the ozone reduction during the period of active sun that caused the jets to move poleward in the first place (cooling stratosphere) and it must therefore be the ozone recovery during the period of less active sun which caused the jets to move equatorward again (warming stratosphere ) and in each case they attribute the ozone trend to human CFCs. However the jets moved poleward and equatorward long before CFCs so their assumption is illogical. Something other than CFCs caused stratosphere temperature changes and consequent jet stream shifts at earlier times so if ozone quantities were the cause it must follow that ozone changes occurred then too and not because of CFCs which did not then exist. So following the logic a more active sun both decreases ozone and stratospheric temperatures and allows a poleward shift in the jets, human involvement not required. A more active sun both decreases ozone and cools the stratosphere thereby weakening the inversion at the tropopause and that is the only way that the jets can shift poleward in the absence of a hefty oceanic shove from below. ii) An active sun somehow accelerates the upward energy flux from the stratosphere. If it were otherwise the more active sun would warm the stratosphere to increase the strength of the inversion at the tropopause and then and only then could the jets be forced equatorward. In fact the jets only go equatorward when the sun is less active as now, or for a more extreme example during the Maunder Minimum when the jets were further south than now and the ITCZ was near the equator. In the MWP when the sun was more active the mid latitude jets were up near Greenland. So logic says that the observed behaviour of the jets falsifies the normal assumption that a more active sun warms the stratosphere and increases ozone. It simply cannot be so otherwise the jets would behave differently from what we observe. Can you show me a time when the jets have ever moved poleward when the stratosphere warmed or equatorward when the stratosphere cooled ? Many have pointed out the short term equatorward shifts of the jets when so called sudden stratospheric warmings occur. For current climate theory to be correct those sudden warmings should have resulted in poleward shifts should they not ? It just doesn’t (can’t) happen yet that is what current climatological theory must imply. Position of the jet stream is directly related to heat release from the Gulf Stream into atmosphere, it takes place in northern latitudes (~ 60 N, Greenland-Iceland area). “Flat out, the capacity of the oceans as the driver of variations, driven by changes in equatorial trade wind systems (which itself starts with the Coriolis affect) to affect all other parameters, is simply overwhelmingly stronger” (than the solar effects). Agreed and I have said as much more than once. However the top down solar effect modulates that larger oceanic effect and the further poleward the oceans try to push the jets the greater the resistance from the then prevailing solar setup. After all, the oceans could never push the jets all the way to the pole. Its like pushing against a rubbery substance, the resistance increases as the pressure increases so it doesn’t really matter that the oceans are much more powerful than the sun, the strain is dissipated by the change in the speed of the hydrological cycle which increases faster the more poleward the jets shift. The latitudinal position of the jets is a function of the speed of the global hydrological cycle at any given moment. Let’s just start with the fundamental physics which all these approaches ignore. GHGs will cause warming. Aerosols will cause cooling. If you leave those two out of your equations, you are going to be wrong. One way or another, you are going to be wrong. It appears to me that Steve has now suffered the same degree of over-confidence in climate causes/effects that has infected many other scientists. I’ve yet to see him or any other promoter of GHGs provide a proof that Miskolczi is wrong. Yet, they have no trouble making assertions that assume he is wrong. So, Steve, where is your proof that Miskolczi is wrong? If one exists I’d love to see it so I can discount his hypothesis. So far, I’ve seen nothing. I won’t even start on the aerosols which can cause both warming and cooling and no one seems to understand the net effect, except for Steve and the IPCC. Bob, I don’t assert that the stratosphere drives the troposphere. Merely that the temperature of the stratosphere affects the strength of the inversion at the tropopause which affects the air circulation below. Furthermore that the solar effect from above merely constrains the oceanic effect from below and vice versa. Neither the sun nor oceans get a free pass. Both are essential to understanding the variability of the eneregy flow up through the troposphere. Show me a warming stratosphere when the jets move poleward or a cooling stratosphere when the jets move equatorward on a decadal timescale. It cannot happen because a stronger inversion at the tropopause always inhibits upward energy transfer so as to increase the high pressure cells around the poles and drive the polar oscillation negative. Some short term phenomena excepted. Vuk, you need to consider it globally. 4. If the correlation is not yet “statistically significant”, repeat 2 and 3 until it is. I’ve spent far more than enough time around academic statisticians to know with absolute confidence that they could benefit from a series of conversations with advanced physical geographers about the nature of the problems encountered in the latter field. In all the lectures I had in stats, whether undergrad or grad, there was no mention of grain & extent (not the same thing as resolution or sampling units). I once sat in on a meeting in which a statistical consultant was “advising” a biologist about an ecological field survey. It was hideous. There was zero awareness of heterogeneity & scale-dependent pattern-variations in the spatial domain. I found it ironic that (most of) the statisticians would teach Simpson’s Paradox and then make little or no effort to recognize it when & where it arises – (too much automatic reliance on inference with insufficient attention to exploratory data analysis & diagnostics to check assumptions). Most humorous of all are those who make flawed aggressive attacks on temporal smoothing while contentedly practicing haphazard &/or arbitrary spatial smoothing. Stephen Wilde, how do clouds fit into your narrative? Don’t they, like the day & the year, play a role in terrestrial insolation (not to be confused with solar irradiance)? PS ( yes aerosols can cause warming and cooling, thanks for reinforcing my point! any simplified model that FAILS to take these into account and fails to treat them accurately, is wrong from the start.. Its like this When you see a model that predicts temperature that doesnt have aerosols… especially when you know they have mixed effects, when you see a model like that, well you know its wrong. THANKS! All the main cloud bands linked to the jets and the ITCZ move latitudinally with the air circulation systems. As they do so global albedo changes because of the changing angle of incidence of solar energy onto the clouds. That change was contemporaneous with the shift of the jets equatorward which I first noticed around 2000. Cloud quantities might also vary but I see the latitudinal positioning as the major factor. The albedo trend broadly follows the shift of jetstreams latitudinally. First downward as the jets moved towards the poles until about 1998 and then upward as the jets moved equatorward again. Mr. Mosher perhaps you should revisit your science library. GHG do not do what you suggest, to the degree you whish us to believe. Atmosphere of planet Mars is made almost entirely from CO2. On change from day to night its atmosphere, at height of only couple of feet above ground, drops from +80C to – 200C within few minutes! A quick look at the annual AMO, PDO and global temperature indexes says a bit more. – Annual PDO and AMO indexes do not correlate at all over their common period, 1856-2009. Since they measure totally different things, what’s the rationale for adding them together? – Annual PDO correlates not at all with GISTEMP or HadCRUT over their common period, 1880-2009, and adds nothing but noise to a regression model. – Annual AMO correlates only r2 = .19 with GISTEMP (or .14 with HadCRUT), so those graphs say somthing quite different from the r2 = .85 achieved by aggressively smoothing, truncating the time series, and looking only at US temperatures above. What little resemblance there is between the raw AMO and global temperature occurs across a narrow range between about 1940 and 1970. But on a longer scale, temperature has been trending unevenly upward while AMO goes up and down. Thus, an “AMO predicts temperature” model (way too simple, but even so a couple of steps beyond eyeballing smoothed and truncated series) predicts warmer-than-observed temperatures before about 1940, and colder-than-observed temperatures after 1975. In other words, neither of these oscillations forecast the observed warming trend. If you detrend the temperatures, *then* PDO and AMO show more evident effects on interannual variations. Many authors have noticed this. 1) The Figure 23 extrapolation (into the future) is fanciful rubbish. PDO & AMO are based on fundamentally different stats. Sensible interpretation of PDO requires deep conceptual understanding of factor analysis (a set of multivariate statistical techniques). Maybe PDO is not the most straightforward metric with which to underpin a simplified narrative (despite the nice [seemingly-intuitive] ring of “Pacific decadal oscillation”). Vukevic : “Atmosphere of planet Mars is made almost entirely from CO2. I see your Mars and raise you Venus. Your remark says more about the heat capacity of a very thin atmosphere than it does about GHG. Trying to resume how point by point the arguments from that paper have been found misleading, misrepresenting the reality and how things are working, mixing multiple sources to pull personnal conclusion (not scientific’s one). In other word just another junk from SPPI and D’Aleo. Please moderator don’t pull that comment as being a personal attack. If so, you’ll have to remove about 90% of your database talking about the IPPC members that most of your poster are insulting every day. As soon has SPPI is putting up a so called paper, you make big head news with it, but on all occasion they are found to be wrong, misleading, bias. Yet you keep pushing whatever they are publishing. I guess Leif and I will remain in disagreement over the meaning and value of Joseph’s and Donald’s analysis. “Smoothing” is a spline interpolation that (hopefully) satisfies the Tchebycheff criteria of a good fit, meaning the maximum error in the interpolation is minimized and variations above and below the weighted means have equal probability. If one set of data are “smoothed” then they all must be within the same sets of data for which a correlation is derived. It is easy to think of examples of “unsmoothed” data for which regressions can be made to obtain an r**2 approaching unity – and completely meaningless, it can happen with “smoothed” data of course but not to achieve a unique value of r**2. Smoothing was done to take out the 11 year periodicity in TSI and other factors to be consistent. Willie Soon uses Hoyt’s data, Willie worked with Willson’s version of Hoyt and Schatten’s data recalibrated to the ACRIMSAT data set (which gave higher values). If Leif doesn’t like Hoyt’s data maybe Leif likes J Lean’s better – but there are problems in those data nevertheless. In conclusion, I think Joseph and Donald shown something meaningful, if Leif disagrees, then we celebrate our differences too. Mars atmosphere (95% CO2) has 2 to 3 times more CO2/m3 than the Earth, while the Venus atmosphere (also 95%CO2) has many thousands times more CO2/m3. Yes that is correct but it is the total density that matters, not just the composition. Mars’ atmosphere is too thin for a large greenhouse effect i.e the other molecules matter as well. Also, your temperatures cannot be correct, even if you confused the units and meant Fahrenheit the temperature range is nowhere near that. I suggest you check them. scroll to 01:04:00. since it is UK programme I naturally assumed its meant C not F.
Of course it is density of whole atmosphere (Venus’ is densest of all inner planets, atm. pressure about 30 times ours) so CO2 per say does very little.